How many unique email accounts do you have? If you have more than just a few, Obtenez Email might seem like a serious time-saving app. It is meant to provide you with access to multiple email accounts via one page, which is Search.obtenezemail.com. If you install the application, this is the page that will be set up as your browser’s homepage or New Tab page. It does not look unreliable if you look at it, but our research team has had the chance to analyze it, and the conclusion is that interacting with it might be dangerous. How so? We discuss that at length in this report, and so you should definitely continue reading if you want to learn more. We also discuss the removal of the suspicious extension/application, which we classify as a PUP (potentially unwanted program). Note that you can delete Obtenez Email manually using the guide provided below, but before you commit to that, it is important that take your time to consider other removal options too. Obtenez Email might not be identical to Get Daily Bible Verses, Easy File Converter, My Weather Radar, and other applications with funny names, but, in fact, all of them were created by Polarity Technologies Ltd. This company is best known for the browser hijackers that accompany the seemingly harmless PUPs. They always redirect to Yahoo Search, but the results that are shown can be modified, and that is why trusting Search.obtenezemail.com is not recommended. The methods used to distribute these potentially unwanted programs are pretty much the same as well. While unique download pages are created (in our case, it is obtenezemail.com) and the installers are also added to the Chrome web store (chrome.google.com/webstore/detail/obtenezemail/oaklknphdiohkhlofegffngccoendnao), they can be spread using unreliable installers tool. 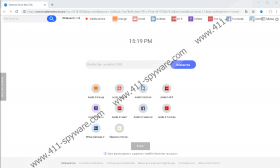 Even if you do not think that Obtenez Email came bundled with malware or even harmless applications, it is a good idea to scan your operating system to check if you need to worry about deleting other suspicious applications/extensions. If you have not scanned your operating system yet, do that immediately. The scanner you can acquire by clicking the ‘Download’ button is free of charge, and you can uninstall it whenever you want to. Most important, it can help you find out if you need to delete malicious threats. If you do, you might need to install anti-malware software. You should not hesitate to do that because this software is important for the overall security of your operating system. As long as it is installed, you will not need to worry about malicious threats attacking you. Furthermore, it will automatically remove Obtenez Email along with other existing threats, and that could save your time and give you peace of mind. If you are sure you want to eliminate the PUP manually, use the guide below. As you can see, you need to remove it as an extension on Chrome and Firefox, but you need to uninstall it as an application on Internet Explorer. Open the Control Panel (access via the search field on Windows 10 or via the Start menu on other versions of the Windows operating system). Move to Uninstall a program and then Uninstall the PUP. Open Firefox and enter about:addons into the address bar to access the Extensions menu. Open Chrome and enter chrome://extensions into the address bar to access the Extensions menu.